Bindery Equipment often has hard-to-reach spots where allen screws need to be replaced. This video shows a quick tip to make this frustrating task easy and fast and works with folding machines, scoring machines, saddle stitchers, perfect binders and other types of bindery equipment used for creasing. 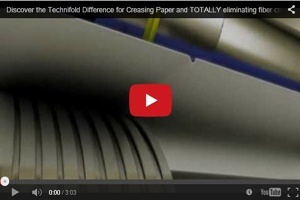 Need to complete rotary paper trimming on your folding machine without ragged, fuzzy edges? Technifold's Multi-Tool lets you run cover stocks 2 or 3-up with guillotine quality cutting. Easily switches to micro perforating for die quality micro perforating on your folder.